Grilling season is here! Everywhere you go, you can smell the wonderful aroma of meats and veggies grilling to perfection. I don't know about you, but just thinking about it makes me want to fire up my Gourmet Guru Grill and get some delicious burgers going for family and friends. Of course, the food is what's on our mind, but what's even more important is: Do you know how to use your grill safely? Here are some common questions about using your Gourmet Guru Grill safely. Should I use lighter fluid to ignite the lump charcoal? No. Do not use lighter fluid or any other chemical to ignite the charcoal. The ceramic construction of your grill promotes moisture retention. This means it will absorb the chemicals and fumes, which will cause unsavory flavors and odors. Can I be burned touching the outside of the grill when it in use? Incidental touching of the outer surface of the Gourmet Guru Grill during use should not cause any injury. Keep in mind, the outer surface could get up to 245 degrees depending on the internal temperature. It is best to keep children away from the grill when in use to prevent potential injury. What about grilling during inclement weather? It is totally safe to use your Gourmet Guru Grill as long as it is safe for you to be outdoors. Your Gourmet Guru Grill is not affected by cold weather or rain, but it is recommended that you use a grill cover on your completely cooled grill when it is not in use to protect it. Where should I set up my grill? 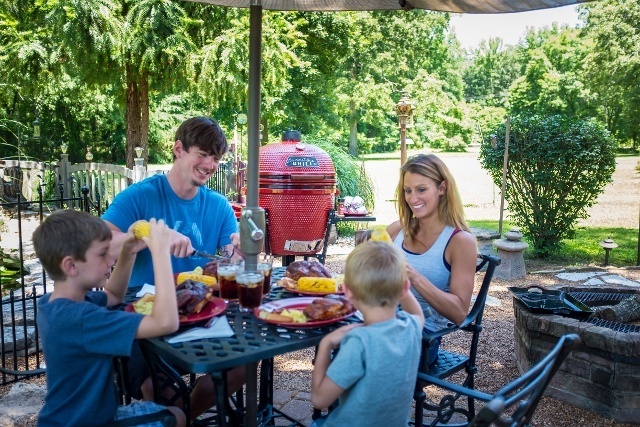 Always grill outside in an open space, placing your grill on a non-flammable surface such as a patio or fire bricks. Check the surrounding area at least 10 feet around your grill for tree branches, eaves, and anything else that could get too hot and be damaged or catch fire. Basically, grill safety comes down to common sense. Never leave your grill unattended when it is in use, don't let children get too close to the grill, and always, always have a way to put out any unexpected or accidental fires, such as a water hose, fire extinguisher, baking soda or a bucket of sand. Enjoy this year’s grilling season and all the deliciousness it has to offer, but above all, be safe! Be sure to check out all of our great Gourmet Guru Grill products below, and if you haven't already, use our convenient dealer locator to find a Gourmet Guru Grill dealer near you and start grilling!